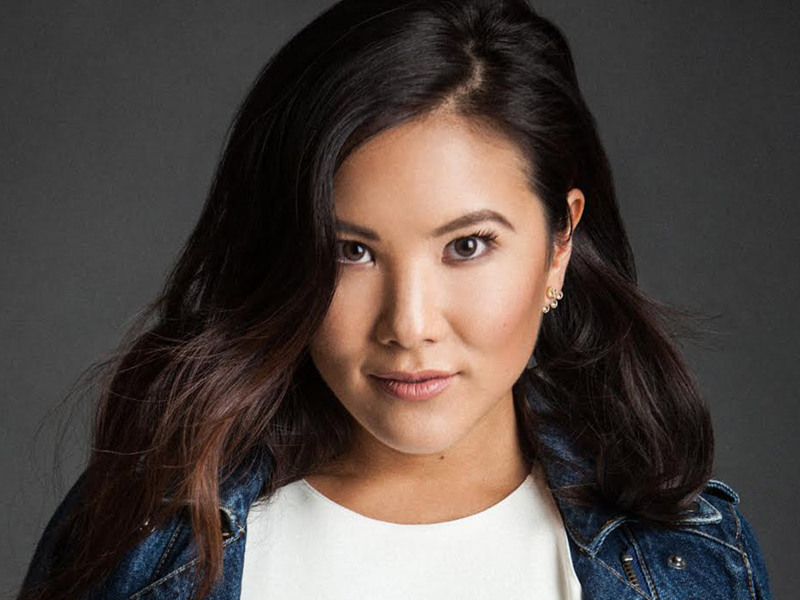 Check our interview with talented actress Ally Maki, who can be seen as Jess—the fun, feisty, and hopeless romantic of the ensemble cast on the new TBS comedy “Wrecked” which will premiere on June 6th. The comedy centers around a group of plane crash survivors adapting to life on a remote island, and adjusting to a new world without their usual comforts of social media, WiFi, indoor plumbing, and Chipotle. The brilliant new series can be best described as Lost meets Gilligan’s Island. My grandmother will always be my role model. She was the strongest woman I know. You can see on my Snapchat, my friends and I love going on fun adventures and capturing weird, random moments. When I’m not working, I love taking dance classes, exploring new places, and spending time with those I love. My first acting role was guest starring on an episode of “That’s So Raven”. I had to work with a giant dog. I think he was bigger than I was at the time. There are so many people that have impacted my life. My parents instilled a good work ethic in me and taught me to never give up. My best friend really unleashed my quirkiness and taught me how to laugh at myself. Please tell us about the new TBS comedy “Wrecked” and about your role as Jess? “Wrecked” which premieres on June 14th at 10/9c is a single camera comedy about a diverse group of strangers who get stranded on a deserted island and have to learn to function in this crazy new world. My character, Jess is a sweet natured romantic who definitely has a mind of her own and strives to be the strong independent woman she’s always dreamed about. I can’t wait for everyone to see what she goes through this season! The amazing casting director Julie Ashton, who had previously cast me in “Two Broke Girls,” called me in for the role to read in front of producers and The Shipley Brothers (who created the show). I really applaud Julie for always thinking outside of the box in terms of diverse casting. TBS really killed it with the diversity on this show, I’m so proud to be a part of it. What is next for Ally Maki? My goal is to continue doing fun and fearless roles that break industry standards and are in some way outside of the box. I love Jennifer Lawrence for her fearlessness and ability to talk about the things most people won’t. Amy Poehler for her comedy, she makes me laugh so hard. My advice for young actors would be to just keep going. If it really is your passion and something you love, just keep at it and never stop learning. My mom always told me that. I cannot live without Drybar Dry Shampoo. It smells so yummy, I’m addicted. There are so many! My favorite designers are Riccardo Tisci, Alexander Wang, and of course Coco Chanel. I see myself continuing to do what I love and hopefully making people laugh in some way. If I can make someone smile then I feel like I’ve done my job. My guilty food pleasures are any and all sour candies, blueberry muffins, and Korean BBQ. My idea of a perfect Sunday includes drinking smoothies on a beach somewhere while watching Netflix? If that’s not a thing I’m making it one! My dream is to go and explore Tokyo with my family. It’s #1 on my bucket travel list. I love hanging out with my dog Jesse. We do lots of cuddle time. Beyond that, I love to read and DANCE! I want to get more into cooking this year, too. I’m a big fan of binge watching Netflix. I also love comedies of all kinds, especially The Office, Parks and Rec, and Bridesmaids. I’ve also been into crime shows lately, even though they freak me out! My pup is a rescue from Wags and Walks which is such a great organization. Beyond that, I want to get more involved with any organizations that promote a strong self image amongst women. I think social media is such a great form of self expression and a way for people from all over the world to get to know you better. It’s kind of a beautiful thing.